I’m not sure what would be the correct greeting for Christians on Good Friday. “Have A Happy Good Friday” seems a bit incongruous, so I’ll settle for a generic “Happy Easter”. Happy Easter especially to the super-Christians who are so prominent in our national life right now - to General Boykin, who assures us that our god is bigger than their god; to President Bush, as he leads us on his messianic crusade to Armageddon; and to all those Americans who have wrapped their racism, Islamophobia and aggressive nationalism in religion and called it Christianity: this post is for you. ... or something more unambiguous and straight to the point like this. They brought Jesus to the place called Golgotha (which means The Place of the Skull). Then they offered him wine mixed with myrrh, but he did not take it. And they crucified him. Dividing up his clothes, they cast lots to see what each would get. It was the third hour when they crucified him. The written notice of the charge against him read: "The King of the Jews". They crucified two robbers with him, one on his right and one on his left. Those who passed by hurled insults at him, shaking their heads and saying, "So! You who are going to destroy the temple and build it in three days, come down from the cross and save yourself!" In the same way the chief priests and the teachers of the law mocked him among themselves. "He saved others," they said, "but he can't save himself! Let this Christ, this King of Israel, come down now from the cross, that we may see and believe." Those crucified with him also heaped insults on him. It’s not a very glorious way to go is it? 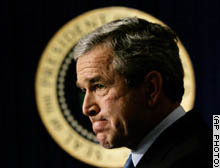 Not glorious; not triumphant, and – worst of all – not very American. So, if I were to be true to the spirit of Good Friday, I couldn't really use one of the usual war-is-great-and-so-is-Jesus images in my Easter post. 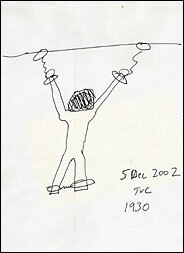 Instead, I settled for the following sketch of an Afghan taxi driver named Dilawar, drawn by one of the U.S. Army interrogators who shackled him to the roof of his cell at Bagram Air Base in December 2002 and slowly kicked him to death over a four-day period, because it was amusing to hear him cry out to Allah for help. When the picture was first published in the NY Times last year, the first thing it made me think of was a Crucifixion scene. 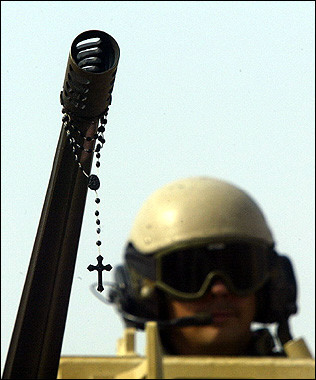 And it still seems to me that this is – albeit inadvertantly – the most profoundly Christian image to have come out of our various wars to control the Middle East. This is how the NY Times described Dilawar's own Good Friday: Mr. Dilawar was a frail man, standing only 5 feet 9 inches and weighing 122 pounds. But at Bagram, he was quickly labeled one of the "noncompliant" ones. When one of the First Platoon M.P. 's, Specialist Corey E. Jones, was sent to Mr. Dilawar's cell to give him some water, he said the prisoner spit in his face and started kicking him. Specialist Jones responded, he said, with a couple of knee strikes to the leg of the shackled man. "He screamed out, 'Allah! Allah! 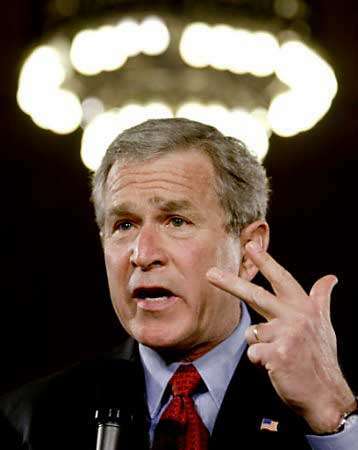 Allah!' 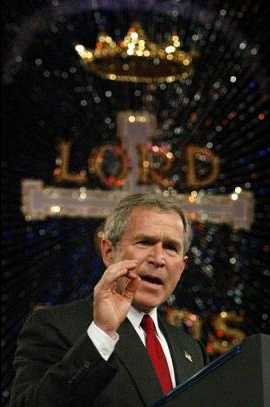 and my first reaction was that he was crying out to his god," Specialist Jones said to investigators. "Everybody heard him cry out and thought it was funny." ... Even as the young Afghan man was dying before them, his American jailers continued to torment him... Mr. Dilawar asked for a drink of water, and one of the two interrogators, Specialist Joshua R. Claus, 21, picked up a large plastic bottle. But first he punched a hole in the bottom, the interpreter said, so as the prisoner fumbled weakly with the cap, the water poured out over his orange prison scrubs. The soldier then grabbed the bottle back and began squirting the water forcefully into Mr. Dilawar's face. Come on, drink!" the interpreter said Specialist Claus had shouted, as the prisoner gagged on the spray. "Drink!" ...The findings of Mr. Dilawar's autopsy were succinct. He had had some coronary artery disease, the medical examiner reported, but what caused his heart to fail was "blunt force injuries to the lower extremities. "...One of the coroners later translated the assessment at a pre-trial hearing for Specialist Brand, saying the tissue in the young man's legs "had basically been pulpified." "I've seen similar injuries in an individual run over by a bus," added Lt. Col. Elizabeth Rouse, the coroner, and a major at that time. 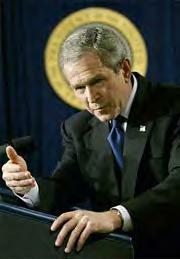 (NY Times, 20 May 2005). Fortunately, militant American Christianity is a small minority movement in a religion that is big enough to absorb the oddities and distortions of our current national insanity. The religious loonies might be the biggest (and definitely loudest) fish in the small pond that is the U.S., but beyond our shores there is a whole world of Christians in established traditions and ancient rites that most Americans have never even heard of, but which carry on happily without us and will continue to flourish long after our messianic President and fraudulent televangelists have departed the scene, leaving their chastened followers wondering how they ever fell for the scam for so long. And that’s just as well, because it is an odd, perverted parody of Christianity that is fuelling our aggression in the Middle East right now: a mixture of aggressive nationalism, ignorant fundamentalism and American exceptionalism that much of the Christian world barely recognises as belonging to the same religious tradition as itself. If you think that’s an exaggeration, consider the death of Dilawar. And instead of asking yourself the “WWJD / What Would Jesus Do?” question that has spawned a nationwide industry of tacky religious memorabilia, try asking yourself "WWJB / Where Would Jesus Be?". 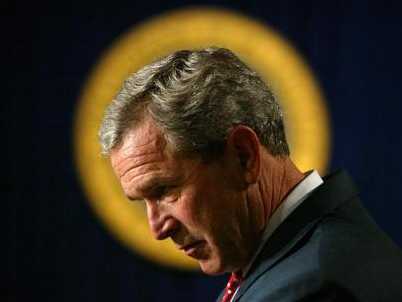 In other words, if He were in that cell at Bagram AB, where exactly would the Jesus whom you claim to emulate be? Do you really think he’d be the soldier with an American flag on his sleeve, kicking to death a shackled prisoner "just to hear him scream out Allah"? Or don't you think it’s a bit more likely that the Jesus who was crucified on Good Friday would be hanging from the ceiling, being tortured to death by a bunch of giggling American sadists and crying out in vain for his God to save him: Allah, Allah, lama sabachthani? When did American Christians stop identifying with Jesus and start being the Romans? Did you realise when you started worshipping your flag instead of your god, that you’d end up on the side that shouts for Barabbas to live and Jesus to die? So, for Mr Bush and Mr Boykin and all their fellow idolators who practice militant nationalism and call it Christianity, here's an Easter card for you. Happy Easter. Happy Easter from Dilawar, who you killed. He was born a Muslim, and died a Muslim, and he's still more Christ-like than the lot of you. An Afghan detainee who died in military custody was injured so severely that has leg muscles were split apart, an Air Force medical examiner testified Tuesday in the trial of a soldier accused in the beating. Army Pfc. Willie V. Brand, 26, an Ohio reservist, is accused of abusing two prisoners in 2002, both of whom later died. The defense has said Brand was ill-trained for his duties and was simply following orders. Afghanistan's government Wednesday said it was disappointed with the "unexpectedly lenient" sentences U.S. military courts have handed down to American soldiers convicted of abusing two Afghan detainees who later died....One soldier has been sentenced to two months in prison, another to three months. A third was demoted and given a letter of reprimand and a fine. A fourth was given a reduction in rank and pay... The soldiers were charged in relation to the deaths of two Afghans who were in detention at Bagram, the main U.S. base in Afghanistan, in late 2002. One of the two was a 22-year-old taxi driver known only as Dilawar. 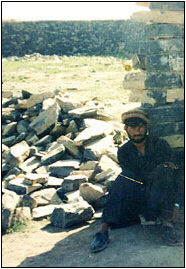 The other was Mullah Habibullah, who was about 30... An autopsy performed by a medical examiner showed that Dilawar's legs were so damaged by blows that amputation would have been necessary, according to an Army report dated July 6, 2004. 2. 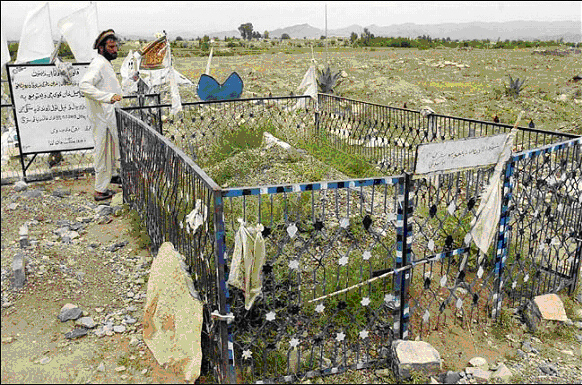 Shahpoor visiting the grave of his brother Dilawar, who died in 2002 after mistreatment by soldiers at the Bagram detention facility. (Keith Bedford for The New York Times). 3. 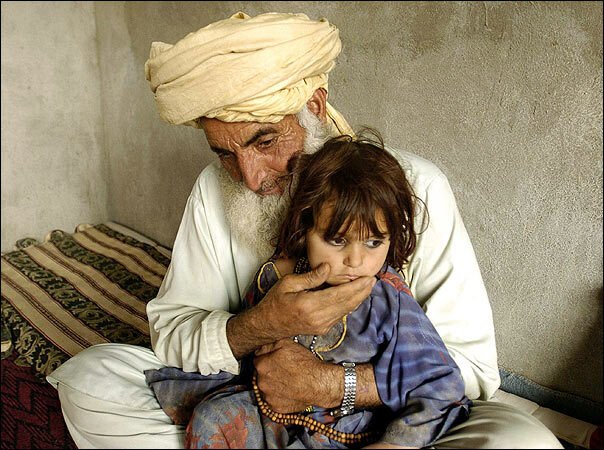 Asaldin holding Bibi Rashida, 3, daughter of his son Dilawar, at home in Yakubi. (Keith Bedford for The New York Times). UPDATE: 1:25am 15 Apr. 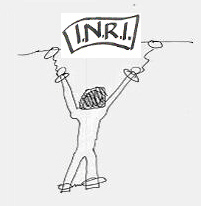 Liberation Tech Support has a post on a similar theme: Crucified Between Two Insurgents. (via A Conservative Blog For Peace).